(Newser) – A Missouri prison nurse who had an affair with a lifer may now face a life sentence of her own. 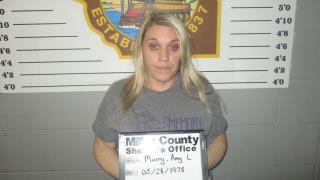 Amy Murray, 40, has been charged with first-degree murder in the Dec. 11 death of husband Joshua Murray, Fox reports. His body was found after a fire at the couple's home. Investigators determined that the fire was deliberately set and Joshua Murray was already dead, poisoned with antifreeze, when it broke out. Police say Murray killed her husband because she wanted to marry Eugene Claypool, an inmate at Murray's workplace, the Jefferson City Correctional Center. This is proof positive that the idiot gene is alive and well in some sectors of our country. Did she think she'd go to the same prison as her new hubby? She could have just divorced him. What a loser! Now this idiot will get to spend her own life behind bars. She was a dumb f*** anyway apparently.